I'm in the midst of getting the house ready for company and I always end up working on things that aren't really urgent but I get a whim for. My framed Bloom Box cover (part of my Paper Quilt) is an example of what is probably procrastinating on what really needs to get done. But seriously, isn't having fun with paper better than dusting, doing laundry and shopping for groceries? 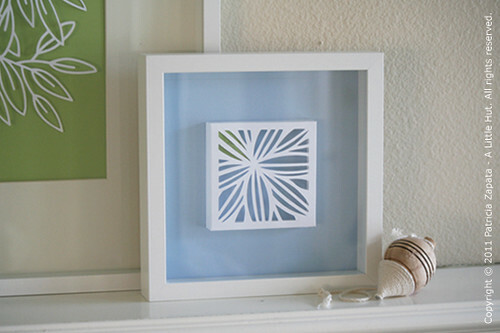 Using the box cover as framed artwork is very simple to do. All I did was cut the outermost tabs shorter and used them to stick the cover to the blue card stock. I also added some green paper (barely visible here) behind the image to add some interest. You can't beat cheap but contemporary wall art! Notice that I added some background color to the Just Leaves lattice? It dramatically changes the tone of the piece. If I keep it around longer than this summer, I'll definitely change the background color again. Like I said on Friday, I may be a bit short on time to blog properly but I'll be popping in with photos. Sound good? 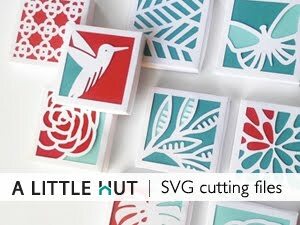 My Paper Quilt and individual boxes are for sale on my site or on Lettering Delights. By the way, thank you to the LD customers that reached out and emailed me over the weekend. I was very touched. Thank you!